Trousers first enter recorded history in the 6th century BCE, with the appearance of horse-riding Iranian peoples in Greek ethnography. At this time, not only the Persians, but also allied Eastern and Central Asian peoples such as the Bactrians, Armenians, Tigraxauda Scythians and Xiongnu Hunnu, are known to have worn them. Trousers are believed to have been worn by both sexes among these early users. 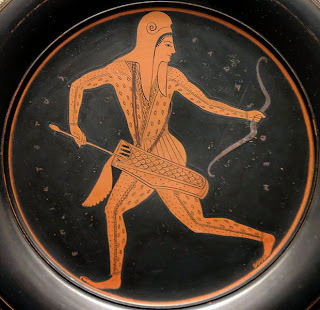 The ancient Greeks used the term anaxyrides for the trousers worn by Eastern nations and sarabara for the loose trousers worn by the Scythians. However, they did not wear trousers since they thought them ridiculous, using the word thulakoi, of thulakos, "sack", as a slang term for the loose trousers of Persians and other orientals. 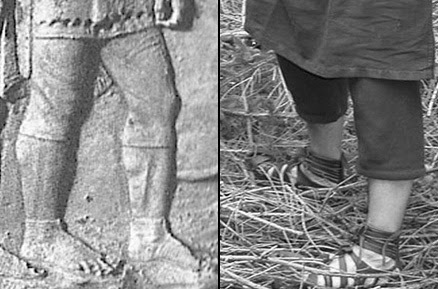 Republican Rome viewed the draped clothing of Greek and Minoan (Cretan) culture as an emblem of civilization and disdained trousers as the mark of barbarians. As the Empire expanded beyond the Mediterranean basin, however, the greater warmth provided by trousers led to their adoption. 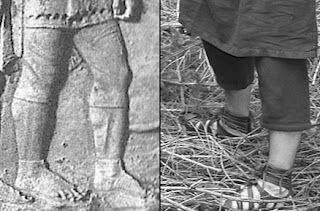 Two types of trousers eventually saw widespread use in Rome: the Feminalia, which fit snugly and usually fell to knee or mid-calf length, and the Braccae, a loose-fitting trouser that was closed at the ankles. Both garments were adopted originally from the Celts of Europe, although later familiarity with the Persian Near East and the Teutons increased acceptance. I'm fascinated by the history of fashion and the reason (or reasons) when men in Antiquity transitioned from tunics and togas to plain old trousers. It took a long time but eventually all men in Western cultures wear only pants. The barbarians won! The Roman Legions I think were the first to wear the pants. Do you have any idea around what year or century this took place? I've read the Roman legion started wearing them around the Dacian wars, around 100 AD. A major distinction between Roman troops types on Trajan's Column is that (barbarian) auxiliaries wear feminalia and Roman legionaries and pretorians still don't. But it has be repeatedly emphasized (by comparison with other sources such as the Adamklissi metopes depicting the same war but sculpted 'on the spot' by the legionaries themselves or artisans locally recruited by the army) that the imagery on the Column is more 'symbolic' (using traditional stereotypes) than realistic: it's likely that when campaigning legionaries already wore trousers when the weather was really cold. I read that Romans were at first reluctant to wear feminalia because the name (same root as 'femur', the thigh bone) sounded too much like 'feminine'!